Now, if your skill is great or your roll good, you just select a sub-section of the matrix to determine where you hit. So if you're a crackshot, you could pick a 6x6 area out of the 20x12 area, say "first D6 is 4-9 on the x-axis, second D6 is 7-12 on the y-axis." Or, in short gamer lingo, "6X4, 6Y7." That's a VERY cool idea for an aimed shot, and it might even work with melee and my ideas about ebb and flow, too. * A melee attack skill lets you pick the quadrant you're aiming for and determines the "area" of it. Different skills and/or weapons allow for larger or differently shaped areas. * THEN, you can delay to narrow down that area further (aiming/calling a shot). Of course, if you delay enough that the defender's "initiative" comes up, he might attack ahead of you. * The KEY is that, once you've rolled to hit a quadrant, your weapon is in that "area" until some later count of initiative. This positioning, in turn, adjusts your chance of parrying against attacks against you in that quadrant. * SO if your opponent then gets to his initiative count and attacks in that quadrant, you'll have a bonus to parry. Conversely, if he attacks elsewhere, you have a penalty as you try to haul your weapon into that new quadrant... should you choose to do so! * REPEAT. Now HIS weapon is in some quadrant for some time period, and that impacts HIS defensive capabilities. Sprinkle liberally with hindering effects from limb hits, bleeding out from wounds that aren't instantly lethal, and attacks to subdue; and I think you'd have a nice system with high verisimilitude but minimal handling. Basically, every combatant would have a chart (like that cool grid above) and maybe some tokens or a dry erase marker (laminate the grids) to mark their weapon's current quadrant and which of their quadrants was last attacked (i.e. their opponent's weapon position). Hmmm.... Wonder if you even need a randomizer, then, or if it could all be done with resource allocation (like action point systems). Ooo! And in such a system, delaying or aiming is how one gets more resources! Spending them dictates how accurate the hit was: you only miss because your opponent expends more resources defending (to "push" your hit off his body grid) than you spent attacking (to "pull" your hit to the best spot in the quadrant that you want to hit). That chart shows the hit locations (red rectangles) for each significant body part. The more boxes there are in a location, the easier it generally is to hit that location. Yellow locations, when hit, generally prove lethal; green locations prove lethal over time if not treated OR have other systemic effects like being disarmed or tripped (system TBD). Most often, combat begins when a character makes its initial attack against another character. At that moment, all combatants' Action Point Pools are refreshed, presuming that no long-term effects of damage have temporarily reduced them. Determined by adding together the APs granted by each combat skill--some grant more than others, while some grant none but instead have other combat effects (disarming, tripping). Ebb & Flow combat is not turn-based. Instead, every character has an Viscosity statistic, which is how many "ticks" of time pass after each attack attempt before the next attempt (or aiming) may occur. A tick is not equal to a second (more like a tenth of a second), and it is only intended to be a loose metric of time passing in-game. Heavier weapons, generally, increase a character's Viscosity but also increase or meaningfully change the "attack profile" (below). An initial attack may be declared by a player at any time: to start a combat or in response to being attacked (if the attack is dodged, but not if it is parried). The attacker simply states the number of APs that he or she is investing, what type of attack (i.e. what "attack profile" per below) and, therefore, which squares he or she is targeting with those points. Those three pieces of information determine the direction and ferocity of the attack. Basically, most weapon types have an AP cost to add additional target squares to an attack. This changes the "profile" of the attack, when an attacker opts to take advantage of it. Some weapon types (usually huge ones) even grant some initial, extra target squares for free, usually with a much higher increase to Viscosity than lighter weapons. Linear - The attack profile weapon must "extend" additional target squares along a single line of contiguous squares. Square - The attack profile must designate additional target squares to make the overall profile as square as possible, which makes using weapon parry much more costly in terms of APs (i.e. each "row" of target squares must be pushed off a hit location; they do not push off en masse). Scatter - The attack profile may designate additional target squares anywhere on the hit location grid; e.g. a shotgun blast or multi-headed flail, which makes both parry and dodge more costly in terms of APs (i.e. the defender will have to pay big to "connect the dots" with a swirling, sweeping parry, to gather them all up and shove them off locations; OR he or she will pay heavily to individually move each one off all locations in the same direction (i.e. dodging a huge distance in the opposite direction). The defender may then respond with the number of APs that he or she is investing in defense. Dodging - For each point invested in defense, the defender may move one of the target squares ONE square in a direction; if enough points are invested to move all target squares off of all red boxes, the attack will be a miss. Note, however, that ALL target squares must be moved in the same direction, to the same ending square (this is very important later)! Note that dodging implies movement of the defender's stance (distance per square TBD) and, as such, might very well result in other effects based on terrain (system TBD). Parrying - For each point invested in defense, the defender may move one of the target squares TWO squares in a direction, so long as his or her weapon target is also moved to a square adjacent to that ending square. Alternately, the defender may use APs to move his or her weapon target to a square adjacent to a target square and then move it AND all other target squares in the line of movement ONE square per AP, and his or her weapon target remains in the square just "behind" that line of movement. His own weapon target, in turn, must also end off a red box: no parry may leave your weapon target on one of your opponent's hit locations. Put differently: when parrying, your OWN weapon target can hit you, if not also moved off any red box!). Note that an unarmed defender may not parry a weapon attack, and a weapon parry of an unarmed attack is automatically a hand hit. Note that drawing a weapon costs a number of APs shown in the weapon description, and its target begins in the square designated by the description; and if it says "A/I" and a number, use the combatant's handedness to decide whether it's in the A (right) or I (left) column at the designated row. Note also that this system utterly supports dual wielding: an attacker may choose which weapon target to move to attempt a hit, and a defender may choose which of his or her targets will be moved in a parry. Finally, a shield is, for all intents and purposes, a special kind of weapon that has a square-shaped target when parrying (2x2, 4x4, or even 6x6 depending upon size--thus, they can move "square" profiles en masse), a typically higher Viscosity increase to wield than a weapon, and a very high additional target square cost (i.e. one can only poke someone with its center spike or slash at the victim with its edge). Attackers and defenders MUST note the square in which their weapon targets end up after a defense; it is relevant to follow-up attacks against the victim. Follow-up attacks work just like the defense system--in fact, Ebb & Flow is little more than investing effort to be the one who finally has the AP surplus and weapon target positioning to make a decisive blow. Basically, if the character is not counting off Viscosity ticks, the he or she may spend APs to move his or her weapon target from its current square to a different square, one AP per square moved, and then may invest further APs to change the attack profile. A defender invests APs to move the target square(s) with a dodge or parry, per above. Note that a defender might have to suffer effects of a lesser hit--for example, pushing a hit from the upper torso to an upper arm--if he or she does not have enough APs or doesn't want to use them all up in defense. I think that's sufficient to illustrate, maybe even to test. Thanks for the inspiration, Christian! Inspiration gladly given That definitely looks ready to be tested. It's difficult to say how it'll work out just from looking at it, because it's quite involved at this point. I have one further suggestion. You could, instead of keeping track of APs and Viscosity separately, simply give players an AP per tick and see if they want to spend them then. Skills would lower AP costs for certain actions. So if you start with 8AP, you spend 6 on an attack, then next tick you're back to 3, then to 4, and at each tick you need to figure out if you want to do something cheap (but not very efficient) or save up for the better actions. It would streamline the system, but then again, you'd have to rework how skills work. The other thing you're right about is that there might not be much variance in the system (weaker fighters having a chance, etc.). You could mix it up a bit with special actions, if you wanted--things you can only do once per combat, for example. The third thing is a question of how to handle more than two fighters. That is, unless your setting is strictly about dueling. God, I hope so... otherwise, no thread survives! I have one further suggestion. You could, instead of keeping track of APs and Viscosity separately, simply give players an AP per tick and see if they want to spend them then. Well... the whole point is "Ebb" after you "Flow"--regaining APs is a conscious choice NOT to take actions, even though your Viscosity isn't holding you back and you (may or may not) have APs. And, for clarity: Viscosity is only counted after you act, while you can take no other actions but defense; and APs are only lost as you act (immediately) or gained as you delay (1 or more per tick), so they aren't exactly "tracked" all the time; just when used/regained. Yeah, you have to track weapon(s) target(s) for each combatant, but that's the whole point of the combat: strategic push and pull of, say, marking stones on the grid (ooo! or bullets! or little pushpins shaped like daggers! or...). Skills would lower AP costs for certain actions. So if you start with 8AP, you spend 6 on an attack, then next tick you're back to 3, then to 4, and at each tick you need to figure out if you want to do something cheap (but not very efficient) or save up for the better actions. It would streamline the system, but then again, you'd have to rework how skills work. One, you can always stop taking delay and pop off something less effective but faster (i.e. low APs). Delay is not a default state. Two, I haven't hardly scratched skills yet--this is all and only a splinter off of the "called shots" idea, so I could develop it more without derailing the other thread. I think it is testable as-is, without any mention of skills, because all "combat skills" would do, eventually, is tweak each rule element (e.g. "Combat Sense" and "Nimble" and such just reduce your Viscosity; "Blade Master" just gives -1 AP cost per additional target square, only with bladed weapons; "Subdue" might just be a +1 per square to Defender's movement costs, but damage is never lethal; etc). Heck, for that matter, this whole system could be mapped onto a lot of conflicts, not just "hit with attack." 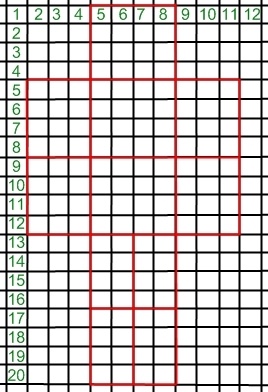 For instance, if that grid were, say, rearranged to reflect areas of personal commitment, morale, or interpersonal feelings (mood), then a "Persuasion attack" might be designed to push a defender's point of view from, oh, "Skeptical" to "Completely Convinced"; and a Debate could be nothing but a duel of wits to see who first scores a head or heart hit (or who first hits the "Convinced" area on a different grid type). Oh, sure. Special moves, combos, or follow-up moves; e.g. "Throw" requires a "Subdual hit" on a lower limb for no damage, but assesses a huge AP penalty to the defender... giving the weak attacker precious ticks to build up AP for that "Smash Head In With Brick" special attack. Dude, what's wrong with using it for guns or bow or slings or laser beam eyes? They just have different AP costs to extend target squares and lower Viscosity penalties and damage result, sometimes. Further, I do not see any reason why one couldn't have as many attackers versus as many defenders as there is room to "realistically" allow exchanges of blows or shots. After all, every person in the fight is a "grid" and every weapon target is one-to-one associated with a weapon. So if there's five weapon targets on "me" at one time, well, I have to be very clever with APs and delays, or become a pincushion. But only one given attempt to hit is ever happening at a given tick (tautologically, by the system: in ties, the lower AP attack goes first, with lower Viscosity breaking AP ties). So a defender--no matter how many targets are on or trying to be on his grid--is always only ever dealing with one weapon target, to push it off his areas by dodging it or parrying it. Finally, keep in mind that one can only dodge ranged attacks, not parry (for now--maybe a Wushu or special skill? ); so the end result is "do I have the APs to shift that shot off my body in one direction?" If yes, fine, keep counting Viscosity (or delay) until your attack on whomever; if no, call for a medic. And, yes, this means that three or four to one is near guaranteed death for all but a master combatant... which has high verisimilitude, in my experience. I spent five years in college playing non-varsity fencing and what you have there is pretty close to the parry lines for you body chart. Save for the distinction between the different parts of the arms and legs that is. Which is part of the question I have about this. Do you plan on accounting for different body postures? If so, are you going to have different hit charts? When I was fencing we did nightly drills on our standard en guard posture. In this case it was our dominate handed side towards the attacker, our shoulders, hips and legs lined up to present only one side and our shoulders slightly out of line and our off hand up, but out of reach for balance. The point in all of that was to keep as much of your body out of the lines of attack. This allowed parries to be far more effective, displacing the attacking blade took only a flick of the wrist. Of course, different martial art schools have different ideas about that. Kendo is much like the Sabre in that it is all about the speed and reach of your attacks and Epee is about feints and ripostes. Is there a problem if there's a min-max strategy, as in someone works out the game like they might work out a seduku? What's wrong with a first turn kill? I'm probing for you design goals here, and I'm wondering if you want to confound an easy answer in play, not to make the game harder, but to keep play going for an indefinate period. Do you imagine play stopping at some point, not because people are bored with it, but because the games reached a conclusion? I think I have accounted for stance, so no I won't have different charts. Different body types might have different charts (ex: quadruped, insectoid, giant) but the whole idea of weapon target point/area is supposed to subsume posture for a given chart. BUT... see below. The point in all of that was to keep as much of your body out of the lines of attack. This allowed parries to be far more effective, displacing the attacking blade took only a flick of the wrist. Of course, different martial art schools have different ideas about that. Kendo is much like the Sabre in that it is all about the speed and reach of your attacks and Epee is about feints and ripostes. Right; and sword-and-board is totally the opposite of fencing (weapon arm back) and dual wield is different still, as is two-handed (and, what's more, as is claymore versus staff). The gist is that a given attack (weapon and its target) versus a given defense (weapon and its current position) adjusts dynamically throughout the exchanges. So, for the most part, stance won't matter OR it will be accounted for as a particular skill's expression. For example, if one uses one's "Fencing Specialist" skill, one might be able to restrict the opponent to only targeting the weapon half of your body (right or left)... until HE activates his "Find Weakness" or "Grappling Specialist" skill, which could nullify or even take advantage of the implied stance from the Fencing skill. Again, it's not a complete system; its a component of a system which will eventually also have skills and weapon stats and armor elements and characteristics for characters. Well, if the combatants are sufficiently different in skill or armament, this system will tend towards first-turn kills. I am speaking more of a "one true strategy" problem between equally matched opponents, where one should always only do a particular type of action. I wouldn't want the system to emerge with an opening move and opening response that one always does, because otherwise one is hamstrung from the get-go. Hmmm... I guess there's not enough of the system here for it to be possible to answer that, right now. I'm probing for you design goals here, and I'm wondering if you want to confound an easy answer in play, not to make the game harder, but to keep play going for an indefinite period. Neither, really. It's all about verisimilitude, and there is no combat maneuver or weapon which has proved to be a guarantee of success, in our history (well, except for the Crane Kick in Karate Kid--"if do right, no can defend"). So if this system shows an obvious "Step One -> Step Two -> Win" pattern then it doesn't attain that verisimilitude. Do you imagine play stopping at some point, not because people are bored with it, but because the games reached a conclusion? "Play" wouldn't stop if this system made one-turn kills or made multi-hour combats; this is but a resolution system for weapon (and unarmed) combat that tries to shift play away from randomizers and hit location charts to something closer to the risk-v-reward, effort-v-effectiveness ebb and flow of actual combat, as I have seen it and experienced it. The "point of play" would be, I suppose, the usual suspects: adventure, slay things, get loot, win friends, influence people. I mean, this doesn't seem to apply to any kind of narrativist agenda, as it is so clearly an effort to simulate actual combat. So there would be no necessary reason to "reach a conclusion" as one might find in a heavily themed (MLWM) or situationally structured game (DiTV). Put another way, there is not (currently) a mechanic which tries to protect protagonists or punish drifting away from theme, becasue neither of those things seem to be factors in real world combat (well, beyond the effects of intimidation: performing less effectively against a known superior fighter). Thanks for the continuing feedback. The more I ponder this basic system, the more interesting I think it could be for all sorts of conflicts: martial, social, intellectual. I really hope you get this to play-testable shape! It sounds like it could supply a fantastic combination of strategy and vividness if streamlined. At the moment, I am intimidated by the handling time (or at least how I am imagining it). I think the list of "if, then" statements regarding you and your enemy's body and weapon positions will make or break the strategic element. Without seeing more weapons, options, special moves, etc., I can't yet respond to your "obvious strategy / insta-kill" query. The "point of play" would be, I suppose, the usual suspects: adventure, slay things, get loot, win friends, influence people. I don't think this will meet your goals because it contradicts itself. If someone is playing the game for verisimilitude, then the "point of play" is to get verisimilitude. If someone is not playing for verisimilitude, then verisimilitude doesn't matter. Oh, it'd be fun to have, but if the system fails to give it, it wouldn't matter because the players not there for that anyway. It'd just be a fun side thing and if absent, unnoticed. If verisimilitude doesn't matter, then your working on the wrong part of the game first. Working on it first will not help to meet your goals. I think your designing this with the idea of plonking it down in whatever game system (either a new or old one). You might want to consider that, given how much your excited to work on it's verisimilitude, does that really mean it's just an unimportant, off to the side resolution? I still don't understand you, Callan, though I suspect you are making a common "Forge Point" about how system matters and must totally integrate with situation and setting to build a "proper" unified whole. Me...? I am a System Doesn't Matter and Design What Doesn't Matter proponent, so maybe I just can't comprehend you any more than I can think of a color I haven't seen. Yes, I think this series of techniques could be a systemic element dropped into a game in place of its existing task resolution mechanics while leaving the setting untouched. Yes, I think it could be a game in itself (i.e. like Magic or maybe Spellcaster or Kung Fu Fighting). But, really... it's just a split thread trying to make a "called shot system" without using randomizers or adjusting "to hit" values for size or any other (seemingly arbitrary, low verisimilitude) traditional methods. I guess that sounds a little dismissive, but taking this thread into "high theory" isn't really the point. It's a task resolution system for weapon combat (and maybe other types of sparring: with wits or socially) that is "genre-agnostic," at the moment, though "realistic" would apply as a loose genre descriptor (e.g. this system wouldn't support shape-shifting psionicists dueling with emotions, I don't think, without serious chart and process and "skills" retooling). But "unimportant?" I just don't understand. It's important because, as written, it generally determines if the character you are playing lives through the encounter or dies (or suffers a disability, I suppose). Thus, playing the resource strategy game that is "pushing around weapon targets" becomes a very significant aspect of successful play, even as it also helps to describe/portray the ebb and flow of the battle; i.e. the exchanges themselves paint a very accurate picture of the thrusts, slashes, parries, and sidesteps that make up the fight (contrast that with old D&D, which abstracted all that occurred over a ten second period in a fight into a pair of To Hit rolls, which might be further "defined" or "described" with hit location checks, etc). Suppose you assume that the "point of play" of whatever game(s) this system is designed for is the same as the "point of play" of the combat system itself. (I sympathize with your desire to leave "the rest of the game" concerns for later.) Then the question becomes, "what's the point of playing with this combat system"? And you've already stated what that is, but I think perhaps you could go farther, and maybe (indirectly) answer Callan's questions in the process. As I understand it, this combat system has two main points: strategic fun, and life-like believability. Do you have any thoughts on which might trump which if the two were in conflict? Depending on the gear involved, verisimilitude might best be achieved if combats involved very few conscious choices, obvious correct strategies, and lots of fatalities -- but that wouldn't be as fun for us strategists. On the other hand, you could rig up a very strategy-friendly bag of "special moves" options that kept combat interesting (and vivid), but didn't always beleivably mimic a combat experience (as often happens when spending hours of play and tons of die rolls and board-erasing on something that took 6 seconds in game time). I've been weighing some trade-offs along these lines in my own combat system. Ultimately, my decision has been to keep the system on the simple side because of my desire for a certain type of immersion. But I don't know if those issues concern you or not. If you are hoping to build a combat system that is strategically fun and also vivid with detail (and I think you have an awesome start going), it will probably be easier to succeed if you don't care too much about true-to-real-world-combat fidelity and "should that really work?" common sense. So my question would be, do you care about those? I'll also throw out something that my game design has latched onto as an interesting strategic concern: attempts to re-position oneself while fighting -- moving around, toward, or away from obstacles, allies, and enemies. It strikes me that this might be natural to integrate into your system (though specific mechanics don't pop to mind). I hope this was constructive. If the best way for you to make progress on the system details is to ignore all of us and just start churning out skills and stats, then I hope you do that! Some version of this needs to be playtested! I don't see any excitement from you for those things. Yet your going to plonk what you clearly are excited about (the design in this thread), right in the middle of a bunch of stuff you don't really care about. Hiding it! It's like your cooking a wonderful piece of steak ...and then hiding it in a huge bowl of plain lettuce, no dressing and a little whilted even. It's like Ron's heart breaker article, where people have real gems of design, but then let them get hidden and suffocated by a bunch of superfluous, D&D like rules as if they had to add those. BUT if verisimilitude isn't that important, all of that salad needs work - it's got no dressing and is whilted. Working on one piece of steak isn't going to help all that salad - as you say your working on one part, and that's the problem, one part wont help all that salad. How important is verismilitude to you, say on a scale of one to ten? And those other things (adventure, slay things, get loot, win friends, influence people), how important are they on a scale of one to ten? I think you'll have to end up choosing, or end up in heartbreaker territory. Stub reply, to let y'all know I'm thinking about it. It's gone from "hey, is this a cool idea or what?" to "maybe I need to make a full game out of this" in a week; and now I have to ponder more. Briefly, though: I could claim that I have great arugula (world) and beefsteak tomatoes (NPCs) and the finest Vidalia onions (situation) but unless I show it all chopped out, here, there's no proof. And, frankly, I don't: I was thinking, literally, about a generic system, suitable to any time and place. To embed it into a full game will mean I have to (a) build up the world in which such dueling is meaningful in play, not a time-consuming side-game that stops the action to resolve fights, or (b) present it as a completely generic game, with means of defining situations that engage the combat system fully, rather than let it fade into the background while you play a "freeform" game. Maybe this is really just a form of board game, like Battleship? But, yeah, Callan, you're right: I'm not particularly exited about "the rest of the salad," yet. Heh... maybe I'm a saucier, not a line cook--someone else might have to take this sauce and put it on a steak and salad they make in another part of the kitchen. I have a very full "project plate," at the moment (GLASS really should be finished first, and I have two Icehouse games in mid-design).